It really shouldn’t have been surprising to see Modern Family lose Outstanding Comedy Series at this year’s Golden Globes to HBO’s Girls. The Hollywood Foreign Press Association enjoys a glass of prestige cable drama Kool-aid, and it also fetishizes new series (and the stars associated with them), which made Lena Dunham and Girls a historically consistent pattern for the organization. And yet Modern Family has been so bulletproof at the Emmys that it still felt like a setback, a sign that maybe the juggernaut would have to wear down eventually… and then the cast won the Ensemble SAG award a few weeks later. I raise the topic of awards because tonight’s episode reminded me why Modern Family is so competitive in that space. “Heart Broken” is formally nontraditional, eschewing a typical, balanced A-B-C story structure in favor of three separate stories told in sequential order, with each featuring one of the three central families: Claire and Phil’s pre-Valentine’s Day rendezvous as Clive and Juliana begins the episode, Jay and Gloria’s attempts to get back in the saddle on Valentine’s Day serve as act two, and then Cameron and Mitchell’s morning-after recovery from a wild party serves as the final act. It’s novel in a way that you don’t always see from a “traditional” sitcom, playing with the basic narrative expectations of the audience. I had that moment early on when I was checking the time, wondering why we weren’t shifting to another character. That confusion is thrilling, and hearkens back to the show’s original conceit wherein three families that were introduced separately are in fact part of one large family. Although ABC eventually balked at hiding the interconnected nature of the three families—creating commercials that spoiled the reveal—the show still has some of that experimental potential left in its DNA. 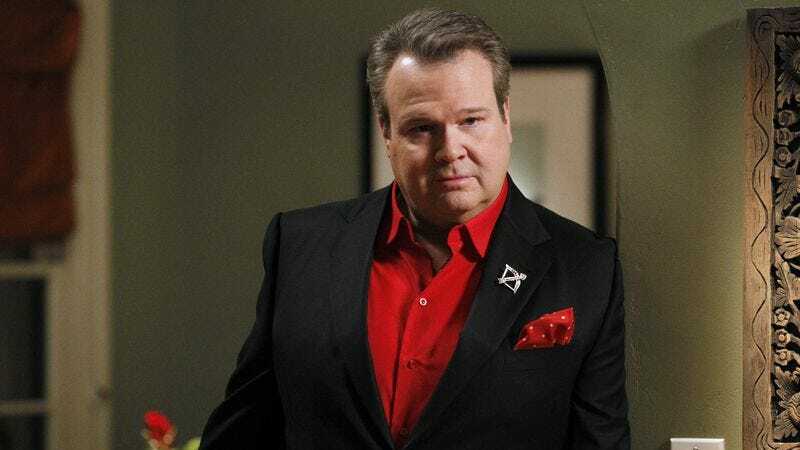 While comparing it to something like Louie or Girls would be pushing it, Modern Family nonetheless wants to be a part of that conversation as much as it can be within a broadcast context, and I have respect for that. And yet, while the episode’s structure highlights the capacity for the show to play with its form in interesting ways, it also forces the show into familiar, typical sitcom patterns. Modern Family struggles most when its storylines are boiled down to clear lessons, and “Heart Broken” does this three separate times: Claire learns an important lesson about vulnerability in the wake of her arrhythmia, Gloria and Jay learn that you can’t completely let your kids go, and Mitchell learns you can have too much fun but that maybe he should occasionally loosen up with a bit of role play. The speed at which each story moves from initial conflict to resolution exaggerates the contortions necessary to reach sappy conclusions, and yet those conclusions are a big part of the show’s broader success. Where the form of the episode may be nontraditional, the stories the writers chose to tell were resolved in ways that would have fit comfortably into any family sitcom in the past two decades, which is exactly what makes it so popular with the Academy’s older voting blocks. As someone who often laments the series’ lack of ambition and its reliance on familiar tropes, “Heart Broken” grew more and more heartbreaking as it devolved in front of my eyes. Each storyline starts in an interesting place and moves quickly, jumping from joke to joke at a distinctive pace for the series (which, while occasionally fast, usually operates at a few different speeds across its different storylines). Phil and Claire’s discussion of nosebleeds pays off only a few scenes after it’s introduced, the baby gate gag is set up and played out in a matter of 10 seconds, and Dylan’s “Pink Panther” lyric—as he serenades Mitchell and Cameron for allowing him to live with them—nicely pays off the Kool-Aid-dyed cat. This type of joke construction is immediately satisfying, with quick pay-offs that keep the episode moving and the audience engaged. However, that joke construction stops dead in its tracks when each act needs to reach its conclusion: Each story, without fail, quickly wraps up the comic hijinks to reach a sentimental moment of self-reflection. By the law of diminishing returns, the third time this happens within a 30-minute period won’t be as satisfying, a microcosm of the series’ overreliance on this mode of storytelling on a week-to-week basis. While Phil and Claire’s storytelling benefits from being first out of the gate, and Jay and Gloria’s storyline has some nice direction from Beth McCarthy-Miller to highlight Jay and Gloria’s frantic attempts to overcome the obstacles in the way of their return to sexual activity, Mitchell and Cameron’s storyline feels like a repetitive afterthought. I appreciate the parallelism of their adoption of Phil and Claire’s roleplaying idea, ending the episode where it began, but separating Cameron and Mitchell so distinctly from the rest of the series only highlighted that I don’t care that much about Cameron and Mitchell. In most episodes, this isn’t a problem: Modern Family has a huge ensemble, and so you can overlook characters you don’t care about and focus on those you do (like Luke, who is sadly underserved here). However, Danny Zuker’s script asks us to identify more strongly with each family individually than in an average episode, and I’m not convinced he makes a case for Cameron and Mitchell. Whereas Phil and Claire’s recurring Clive and Juliana personas tie into our long-term relationship with the series, and Claire’s heart episode registers as a major life event, and little Joe shows Jay and Gloria growing into their new family dynamic, Mitchell and Cameron are just given a wacky party to throw with hilarious morning-after consequences that randomly involve Dylan and a bunch of reindeer that apparently had lewd acts committed against them. Whereas the episode’s formal experimentation serves the show’s other characters well, it only highlights the relative lack of consistent development the series has managed with Mitchell and Cameron over the course of the series. “Heart Broken” earns points for creating a unique structure, something I always appreciate from a sitcom, but that structure isn’t unique once you get past its basic organization. While telling the story of February 13th-15th through the three different families sounds distinctive on paper, the rhythms of each storyline are simply the rhythms of a traditional Modern Family episode shrunk down. This means you get brief, concentrated doses of what the show does best, like sharp jokes, quick pacing, and solid character beats—there are some very enjoyable moments here. However, it also means that you get three times as much heartfelt resolution, a quality that does not in fact grow more interesting the more times it’s repeated within an episode. While it may be positive reinforcement for Emmy voters looking for familiarity disguised as a cutting-edge sitcom experiment, it’s the opposite for someone who wishes the show could find a better balance of humor and sentiment on a week-to-week—or, in this case, story-to-story—basis. I’m not sure why Dylan was so adamant about announcing his entry into Cameron and Mitchell’s bedroom—doesn’t he know we’re never allowed to even see them in a state of undress? Just look at their post-party sleeping arrangement: above the covers, fully clothed. I don’t particularly like Claire as a character, but Julie Bowen is excellent at playing her, and her deadpan delivery on “Haley, revive your sister” was a winner. Maybe it’s that I was recently catching up on the show and balked at the casual racism/sexism of Mitchell’s suggestion always knew Lily might be a terrible driver (which was in “Party Crasher”), but Phil’s implication that the doctor’s refusal to respect his sexual appeal makes her a lesbian also stuck out for me. I do, however, feel confident in saying that Lily is a terrible actress. This is mean, yes, but she’s just incapable of delivering what the scripts are asking of her in anything close to a natural fashion. I have to wonder if the producers will jump in time and recast again at some point in the near future. Another issue with the Cameron and Mitchell plot was that the reveal of Cameron being the one to invite Dylan to stay was treated like a big deal but was in truth predictable—while other elements of the episode felt choreographed (the nosebleed, the gates), there was satisfying physical comedy to go along with them which the Dylan reveal lacked. While Todd noted in “What’s On Tonight” that it was fitting I would be covering in the same week I wrote about the show’s use of the mockumentary style, this was an episode that largely avoided the device, perhaps because the writers didn’t need to use talking heads in order to reorient viewers when switching back to another storyline (since they, of course, never switched). That being said, I’d be interested to hear how you feel the talking heads are generally used in the show: I posit in the article that Mitchell and Cameron tend to share more talking heads, so as to contextualize and normalize their storylines for less progressive viewers, but I’d be interested to hear your thoughts on that.